An attempt to prepare organizations for a new business culture of rapid change. Companies once insulated themselves from the disruptions wrought by sudden change; now, the zeitgeist encourages businesses to embrace such opportunities for salutary transformation. 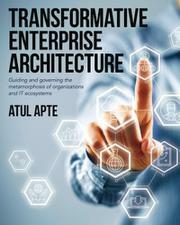 In his debut effort, Apte says that information technology ecosystems are key to any organization’s ability to respond to change—and therefore, integral to future success. He devises a perspective that he calls “transformative enterprise architecture” or “TEA,” through which one can interpret an IT system’s viability. The author’s considerations are impressively synoptic, even exhaustive, as he covers decision-making processes, data models, value management, and even the significance of visual modeling. The primary, guiding principle of the study seems to be the necessity of a “holistic” analysis that considers all components of an IT ecosystem as interdependent. Apte is at his best when discussing the range of elements that one must address when building strong IT structures, and their relationships to one another. He also understands that adaptability must be combined with “resiliency,” or durability in the face of problems. The book largely lacks the specificity of a how-to manual; as such, it’s more of a reflection on fashioning a blueprint than it is a blueprint itself. Also, the prose can be frustratingly bloodless and jargon-laden, as is often the case with contemporary business books. The point underneath this gratuitous convolution, for example, is almost comically banal: “By using a simple heuristic scale between one and four, TEA is able to represent the determination of urgency, which makes the formalization of transformation urgency feasible.” That said, patient readers will still find the book to be full of timely, thoughtful reflections. A searching look into the evolving world of IT enterprises, despite unfortunately hyper-technical language.